Have you wondered what are the secrets of great performing artists, and how you could work toward becoming one yourself? In our Technique I, II, and III classes, you will experience the foundation of what Stanislavsky considered his ‘greatest discovery’ after 40 years of research: Psychophysical Action. (The "secret" deemed by all great actors to produce organic behavior & spontaneity in performance). Master Teacher, Philip G. Bennett, will share with you what he has found to be the most successful acting techniques from his 50 years of teaching the System. You will learn: Focus & Concentration through Yoga based Meditation; Psychophysical Conditioning Exercises that unite the mind and body and release spontaneous emotions; all 89 Elements of the Stanislavsky System based on Action; Short and Long-Form Dramatic Improvisation tools used with ‘Active Analysis through Physical Actions,’ and applied to the interpretation of a text; Monologue & Scene Study...just to name a few. Students who show proficiency take part in public Showcases of selected Scenes and Full-Length Plays. If you’ve been intimidated by, struggled with, or lacked the tools to master Shakespeare--we have a solution for you! In Shakespeare Meets Stanislavsky, Master Teacher, Philip G. Bennett will show you how to fall in love with the language and brilliance of Shakespeare, by simply getting on your feet & learning how the embodiment of words are physical as much as they are psychological. Through the Royal Shakespeare Company’s Voice and Speech techniques, and Stanislavsky’s Active Analysis combined with our Psychophysical Conditioning Exercises; you will gain tools toward developing an expressive vocal and physical instrument; discovering the logic of a character’s thought and speech patterns; and learning how to color your words in order to affect others emotionally. Classical acting skills will give you an edge in auditions and ease to the portrayal of contemporary roles. 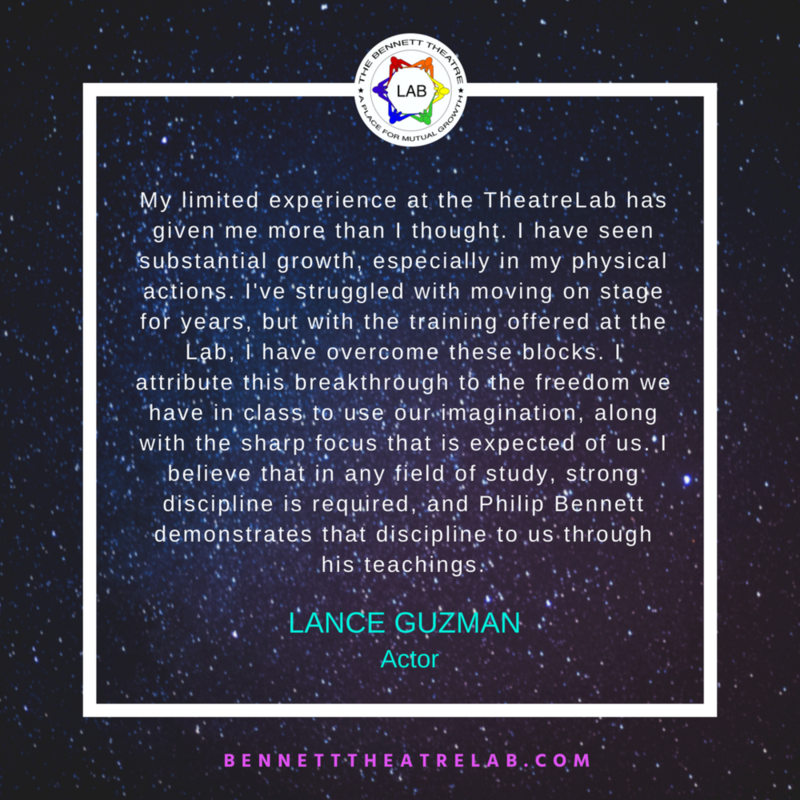 At the TheatreLab, you will soon be on the road to mastery: having the ability to build a living-character, express nuance, and fully utilize your natural voice and expressive speech, while simultaneously up-lifting and moving an audience! Includes 8 weeks worth of classes. FULL-TIME: Saturday, Sunday, & Monday Classes - $350.00 per term; 6 terms per year. PART-TIME: Saturday or Sunday Class ONLY - $175.00 per term; 6 terms per year. Tuition is due in full by the first day of the first class, excluding your free audit. Payment arrangements can be made by need and mutual agreement. As fees are subject to change, please "Contact Us" for further information. Every actor with talent has a spark of genius. The goal of our System of training is to identify that spark, bring it to the fore, and develop the actor’s technical skill and confidence to do so independently. We are committed to bringing the most up-to-date acting techniques and decades of professional coaching experience to you. "Your success is my sole concern." Sliding scale payments for an hour and fifteen minute session!